» Programming fuses, AVR speed_check possible? and the configuration below is what I have chosen to get those fuse bits. It would be of great appreciation if someone can tell me the way to verify at which clock speed the AVR's core is running currently. 22MHz is above the maximum of 20MHz for that chip. I don't use AVRDUDE but if the chip is still running that means that it's OK.
as you advised I enabled the CKOUT on PORTB1, so now the scope measures frequency which is 22.5/7 Mhz. Does this assure now that the AVR core is running at 22 MHz?. Also I am a bit concerned about this small jumping of the frequency 22.2- 22.5.MHz. Where it stems from?, maybe the scopes time-domain is a bit out of calibration, or should I changes the capacitors to a higher values rather than 22pF. Also why the signal is not a square wave? shouldn't it be a nice square wave? Yes. But as has been said above, you are now running your chip out of specification so you run the risk of things not working as they should. Do not change the capacitors. And see my answer to the next question. Your scope is sampling the signal at 200 million samples a second. That sounds a lot but your are sampling a 22MHz signal which means that the scope is only taking 9 samples on each cycle of your signal. Therefore it cannot know that it should be a square wave and can only display using the data it has. Also, how good are your scope probes and how good is your ground connection to the probes? Therefore it cannot know that it should be a square wave and can only display using the data it has. so it means that the signal actually is square wave, and not this one which scope represents at the moment. The scope is connected to mains. There is no other Ground connection applied. For the probe, I use the ground-clip on the probe and attach it to the same Ground Rail which AVR is attached to. The bandwidth of the scope is 100MHz. Any chace to improve the picture?. the scope probe has capacitance and the clkout has limited drive capability - this equates to a low pass filter. As well, have you adjusted the compensation on your probe? With some experience you’ll get to know when the scope is lying to you and that the real world is somewhat imperfect. Same scope settings every time, same 16MHz signal. All I've done is move the ground point around. Signal is on CH1 of the scope. such a dramatic change of the hole signal just changing around the Ground Rail mhhhh.... Could you please let me know how you use the different Ground-Coupling techniques you presented on pictures 1-3. There is actually no place on my probes to do a compensation although the tool is supplied, but I cant find where it would be possible to make compensation. Just checked the manuals, .... nothing about probes either. More than anything it's the ground that needs to be right - don't run half a mile of cable from the PCB to the ground connection of the probe - try to make sure it's a close connection to the signal you are observing. One thing you can do if the board is thu-hole plated with large ground areas is solder a cut-off from a resistor/capacitor lead into some of the thru-holes near interesting looking signals then clip the scope ground onto that. But did you see Brian's picture in #9 and that "sticky out bit" to the side of the scope tip? That is a "close ground" - make sure it connects with some part of the ground on the PCB/device. The circled red hole looks very much like the access port to the probe compensation capacitor. But the photo isn't clear enough to be definitive. Perhaps the printed manual tells all. Most xtal's need some time to stabilize after power up, so I would investigate and use a longer SUT time then 0 ms! The scope may have 100 MHz bandwidth, but the probes are only 20 MHz (and without 10:1 attenuator), so they will definitely mess with a 22 MHz square wave signal. 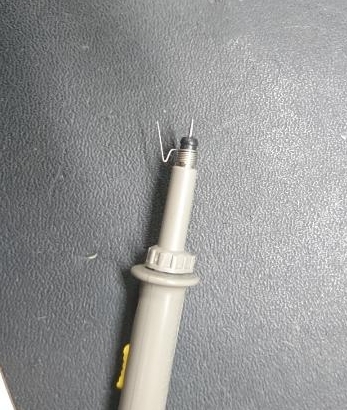 I tried to get access to that Hole on the probe's BNC connector, but no chance, I can't twist it or remove, i'm afraid I might damage the connector. Welcome to the microcontroller digital world! Since a 22MHz crystal and its caps were added to the design, and the microcontroller works, then none of the above discussion is relevant to anything. Yes, uCs can be 10% overclocked. No, the manufacturer will not legally guarantee it 100% of the time for millions of devices. But manufacturers will not legally guarantee that the sun will come up tomorrow. It doesn't mean anything. As a general rule, if you are overclocking a microcontroller for more performance, then it is time to upgrade to a faster family of microcontrollers. There are ARM processors that run at 40+MHz and cost the same as an AVR. OK... now understood. Your probes are the lowest performance standard of that range and have no compensation facility. You will never get a better waveform using them. what a pity. I guess I need to get a new scope. Or it might be possible just to get the probes with compensation. But then these probes will cost something like 50 € here. So I guess I could upgrade the scope, instead. Any advises would be really helpful. Have you tested your probes to see if they need compensating? Most scopes have a test point for this very reason. What is the purpose of this hunt? Surely, there are application areas where a "quality" 'scope setup is essential. But generally not for AVR work, where most apps run at a few MHz and nearly all external signals are much slower. So what if your picture of the clock is a bit skewed? What are we trying to accomplish here? Why is it important at all if the signal reads at 22.2 or 22.5? Surely if it is that important that would mean you need the proper measuring equipment and need to be willing to pay for it. well, I agree with you mostly, but my concern regarding the measurement is something what I can trust. When I use scope to check something it means I trust that instrument and what it presents me. So imagine if this trust is kinda not there, then how can I work?. When I first so that skewed clock signal, It made me think that something was wrong, which as not the case. You know it better I guess. Faith in toolchain. Probably then you are looking for something different than I do in general AVR work, mostly industrial and commercial. Yes, I am merely an aging bit-pusher. If I want to look at the AVR clock with the 'scope, I'm just concerned that it is clocking, and about what it should be. (We've had a batch of mis-marked crystals, for example.) Yes, if you might be quantifying different brands of high-speed crystals for some kind of precise work, then you ned different equipment. Otherwise, then, can't you extrapolate your argument and you need zillion dollar tools, as every lower level will not be as accurate/precise? My recommendation: Realize the limitations of what you have, get over it, and proceed with doing your over-clocked applications. Indeed this is somewhat ironic -- didja ever think that the jitter >>might<< be caused by exceeding specifications by 10%? i will stick to your advise, assuming that it's not going to have any influence on the setup itself. Yes, I am merely an aging bit-pusher.